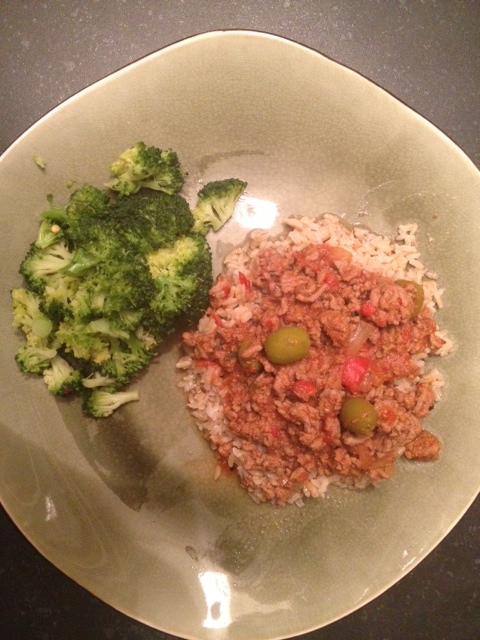 Picadillo | Om nom nom! I really enjoy Cuban food, but this was not something I have tried before. When I saw it on Skinnytaste, I thought perhaps it was worth a try, as it was pretty healthy when made with very lean ground beef (in this case I used 96%, but 93% would fine). I checked out some other recipes and will modify a few things next time because we like a lot of flavor, but this was quite good! Definitely a keeper recipe, and the great thing is that it can be made in the slow cooker! Directions for both below. We served this over brown rice with steamed broccoli on the side. Transfer the meat to the slow cooker, then add tomato, cilantro, tomato sauce, 1 1/4 cups water, green olives (toss in a little brine) then add the cumin, garlic powder, bay leaves and cayenne. Set slow cooker to HIGH for 3 to 4 hours or LOW for 6 to 8. After it’s ready, taste for salt and add more as needed. You may need extra seasoning in general since the crock pot tends to mute them. Discard the bay leaves and serve over brown rice. Heat oil in large pot over medium-high heat. Add onion, pepper, and garlic; sauté until onion is soft, about 5 minutes. Add beef; sauté until cooked, breaking up with back of fork, about 7 minutes. Add all remaining ingredients. Simmer until picadillo thickens, stirring occasionally, about 20 minutes. Season to taste with salt and pepper. Discard bay leaves. Serve picadillo warm. Makes 6 servings, about 260 calories per serving (per MFP).